As a foreigner staying in India for 180-plus days, I’m required to register with the Foreigner Regional Registration Offices, or FRRO. I had heard that this can be a trying process involving lots of queues and paperwork, and requiring much patience. Fortunately, Amrit and I went into the process expecting this. Otherwise, we would have felt thoroughly exasperated. Our day started with a trip to Khan Market, a nearby up-scale shopping area, where we got photocopies of all of our paperwork, as well as a dozen passport-sized photographs for me for Rs. 100 (About $2). 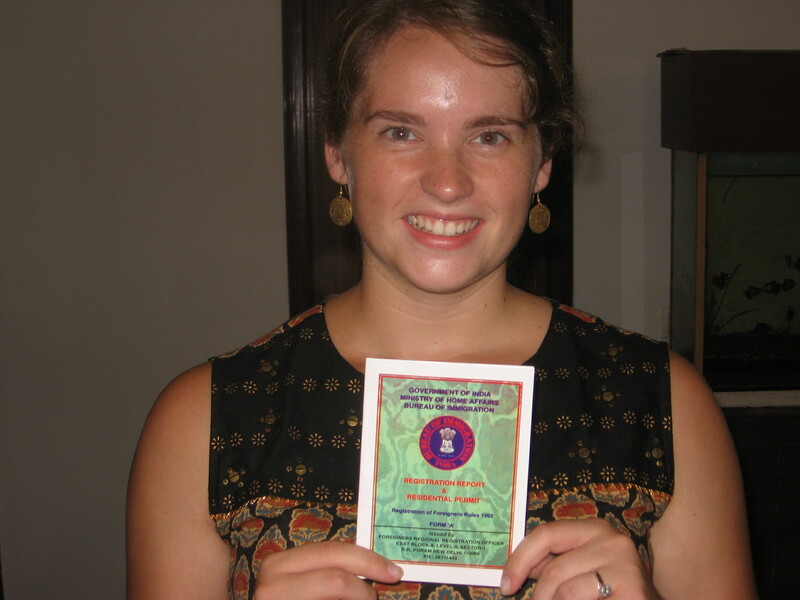 Passport-sized photos, Amrit tells me, are an absolute necessity in India; something to be carried at all times. You need them to register for anything and everything, to open a bank account, or even to buy a cell phone line – so having a few spare photos is always a good idea. On the drive from Khan Market to the FRRO, I had a good laugh when Amrit pointed out this unusual rider on a passing motorcycle. 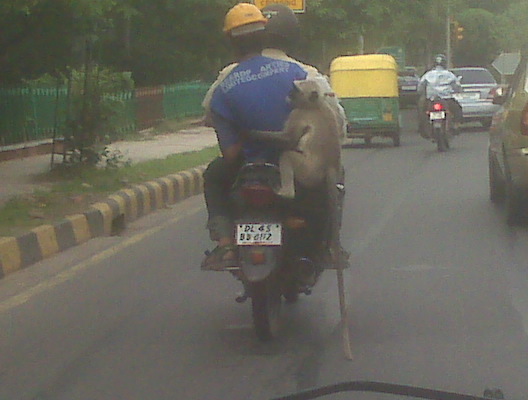 I’ve seen a lot of strange things on motorcycles in Delhi, but this was my first time seeing a monkey riding as well! Our amusement over the monkey was short-lived, however. Within a few moments we were stopped by a police officer standing in the road, and directed to pull over to the curb. The police had set up a whole blockade, and were stopping and ticketing any drivers who were “overspeeding”. There were at least ten cars already pulled over, and the police were stopping more by the minute. We were given a Rs. 400 ticket (about $10), which we had to pay on the spot. Unfortunately, Amrit had just spent his cash at Khan Market. This meant that we had to make a quick run to the ATM while the police held Amrit’s driver’s license. After one broken ATM, a parking lot packed far beyond capacity, and an argument with an irritable parking attendant, we made it back to the police blockade, paid the ticket, got Amrit’s license back, and continued on our way. During the time that we were away at the ATM, the police had managed to pull over a whole new batch of drivers. We finally made it to the FRRO, though an hour later than we had expected to reach. Inside we waited in a long line of tired-looking foreigners. The wait was mildly unpleasant – it smelled unmistakably like urine as the line wrapped around the entrance to the bathrooms; I spotted a few cockroaches scurrying around; there was a thirty-five minute standstill as the whole office shut down for lunch; and the whole place smelled slightly of body odor. I had a book with me, though, and Amrit was good company, both of which helped to pass the time and made the wait more bearable. I did become annoyed, however, when, after nearly three hours of waiting, we were told to return tomorrow with further proof of address (apparently Amrit’s driver’s license wouldn’t cut it), and copies of Amrit’s expired Indian passports (thank goodness he saved them). And no, we could not jump ahead in the line tomorrow simply because our paperwork had already been checked once – we would have to start over at the very beginning of the line. The next day we returned to the FRRO first thing in the morning, hoping to beat the line. Unfortunately, we had underestimated how determined the other firungis (the Hindi word for white foreigners) would be. Some of them had been waiting since 7:30 am – two hours before the office even opened. I waited in the line outside of the building while Amrit saved us a spot inside. Yes, I realize that some would consider this “queue-jumping”, and would find it unfair, but I felt justified after having already waited three hours the day before. The wait inside was, again, long and uneventful. When we finally reached the first desk. the man scrutinized our papers, but eventually let us through. From there we waited in yet another line (at least there were chairs this time) for our number to be called. The man behind the next desk was much friendlier, and even made jokes with us as he went about stamping all of my forms. At our last and final stop – one more signature to wrap everything up – we had a very pleasant conversation with the man who appeared to be running the whole operation about how we met, and he congratulated us on our upcoming marriage. Three hours after we arrived, we emerged successful from the FRRO. Carrying my newly stamped and approved FRRO card, we headed to the All-American Diner for a celebratory lunch. Strange coincidence. Ethiopians have the same word for white foreigner firungis. It’s pronounced “for-en-gee,” and it rolls off your tongue quite nicely. Is it pronounced like that there as well?? I love reading an interesting FRRO post, but I got totally distracted from this one by that darn picture of the monkey on the bike!!! 😛 It’s too funny. Is its tail actually dragging on the ground?! I just couldn’t stop laughing at that monkey! It was letting its tail drag along, but still somehow avoiding all of the tires of the surrounding traffic!